After a year marked by historically low levels of stock market volatility, the first quarter of 2018 brought renewed variability in stock prices. January was largely positive before a stinging 10% plunge in early February. The volatile quarter ended with the S&P 500 down just less than 1%. International equities were mixed for the quarter, with developed countries falling slightly and emerging markets posting a small single-digit gain. Core fixed income felt the pinch from rising interest rates and inflation expectations. The Barclays U.S. Aggregate Bond Index dropped 1.5% for the quarter. Partly in response to higher interest rates–which lessens the relative attractiveness of their respective yields–energy infrastructure (including MLPs) and REITs fell about 10% and 7.5% for the quarter respectively. A change in income tax allowance policy also affected MLP performance for the quarter. The first quarter of 2018 marked the debut of incoming Federal Reserve (Fed) chairman Jerome Powell, who is widely expected to support prior chair Janet Yellen’s approach of gradual rate increases and a highly telegraphed reduction of the Fed’s balance sheet. The outcome of the March Fed meeting suggested that these policies will be carried forward as long as economic and employment trends continue. At that meeting, the Fed raised its Fed funds target to 1.5%-1.75%, the sixth such hike since the Great Financial Crisis. The Fed also announced that two additional hikes are expected in 2018, and three in 2019. An important aspect of the Fed’s dual mandate is moderate inflation. The Fed has consistently targeted 2% and are closing in on this goal as inflation creeps up to that level. While the modest pace of inflation might be expected to comfort markets, that has not been the case. One reason for this is that investors are beginning to question whether bonds, which have been moving more closely with the stock market, will continue to serve their expected role as an effective equity risk hedge. Since the end of the last financial crisis, the Fed has frequently shared future targets for interest rate increases, only to walk them back amidst weaker than expected economic data. The “lower for longer” state of affairs in interest rates has provided a favorable backdrop for U.S. stocks and bonds. More recently, however, economic data has shown improved firmness, suggesting the Fed may actually follow through with their expected rate increases this year and next. As rates rise and the Fed’s balance sheet shrinks, the performance of both stocks and bonds could be affected in significant ways. Before delving into specifics, consider a retrospective view of the past 70 years. Culminating with a peak in 1981, interest rates rose steadily for approximately 35 years, and did so with a vengeance in the final years as then-chair Paul Volker slammed the economy into recession intending to stamp out inflation. In 1981, the median age of the baby boomer was 26. A flood of people were entering the workforce at that time and the economy was doing its best to absorb them. As the increased number of workers began spending their earnings, the market experienced an inflationary spike. The Arab Oil Embargo certainly contributed to the inflation of the 1970s and early 1980s, but the introduction of the boomers to the workforce was an important factor in inflation’s meteoric rise and in the subsequent jump in interest rates to nearly 20%. Inflation is rooted in the basic economic tug between supply and demand. For example, oil prices collapsed a few years ago despite growing demand because a glut of supply hit the market. One reason inflation remains moderate both domestically and globally is because demand for goods and services is being tamped down as baby boomers are retiring. Just as boomers put upward pressure on inflation upon entering the workforce, their departure from the workforce has placed downward pressure on inflation. However, up next is millennials. As of the 2015 census, millennials in the U.S. total more than 92 million and now outnumber baby boomers. 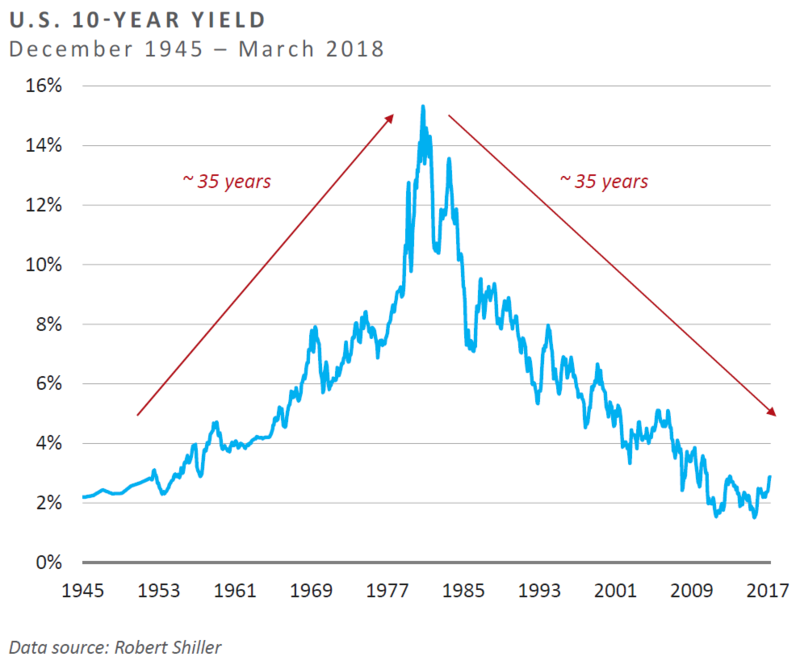 Should investors therefore anticipate a rise in inflation and comparable response from interest rates similar to the one caused by boomers in the coming years? Probably not. Although millennials represent a massive block of potential consumption, their impact on inflation is not expected to be the same as the boomers in the 1970s. By some estimates, millennials earn 20% less than baby boomers at the same age in life, many are saddled with debt, and a large percentage live at home well into their 20s.1 They are, however, digital natives who are comfortable using technology to do just about everything, which is already having a transformative impact on markets and economies . They are not buying homes at the same rate as boomers years before, but millennials are buying technology, and technology is disrupting a whole host of industries, including energy, digital and video content, transportation, and beyond. 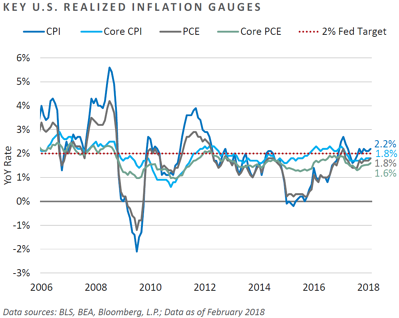 Inflation may be on the rise, and with it, interest rates, but neither is likely to accelerate well past a modest ascent. Short bursts upward in interest rates can levy catastrophic impacts on stocks and bonds. Although less dramatic, steady rises in rates can impair returns. The past 35 years or so have been golden years for equities and fixed income supported by the “duration tailwind” of declining rates. Although rates do not seem likely to return anywhere near the levels of the 1970s and 1980s, the absence of a duration tailwind should temper return expectations. The biggest stock market story of 2018’s first quarter was the sudden change in volatility from tepid to raging. 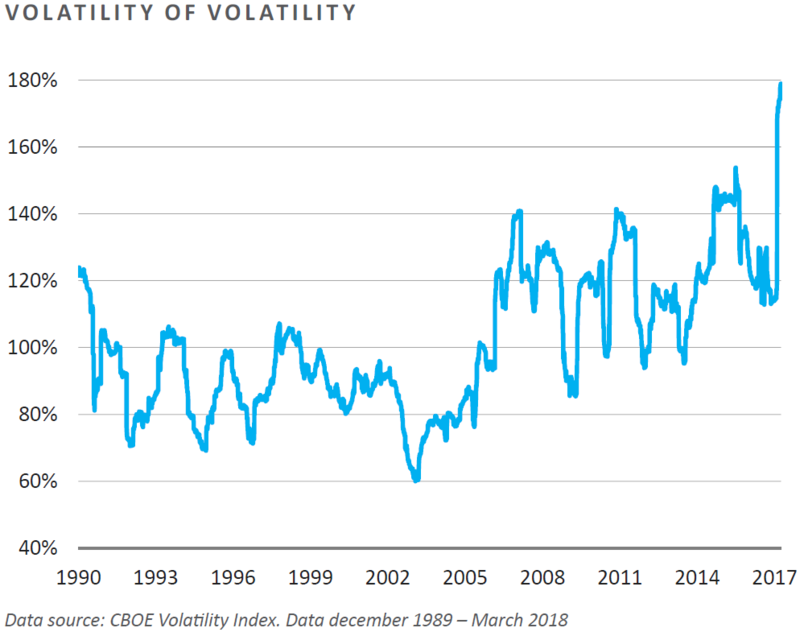 Many people described the massive spike in stock market volatility at the beginning of February as an anomaly, or at the very least, a substantially rare event. It was, in fact, quite rare–the 1-day, 116% jump in the CBOE Volatility Index (VIX) was the largest in the VIX’s history dating to 1990. Garnering less attention was the equally anomalous tempered volatility that preceded the jump. Movements of any meaningful size either up or down were virtually non-existent last year. 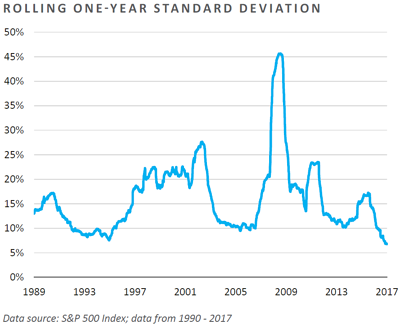 Realized volatility in the form of standard deviation plunged to just 6.8% at the end of 2017, which was the lowest level since 1965 and less than half the long-term average of 15%. That shifted suddenly in early February as stock market volatility lurched higher to what now may be a more normal-to-higher regime. If we get a sharp move higher in VIX, there will be snowball effect. If it is big enough, monster positions, like $2.5 billion of short VIX ETFs will have to be bought back in a hurry. And let me break it to you, there is no one large enough to take the other side of that trade. At least no one willing to do it without extracting many pounds of flesh first. —Kevin Muir, "The Macro Tourist," November 23, 2017. Tobias Adrian, director of the Monetary and Capital Markets Department of the IMF connected the increase in volatility to subsequent stock market declines–dealers who took the opposite side of VIX shorts went long stocks or futures to hedge, then when positions began to unwind, dealers sold stocks and futures as positions closed. A sustained increase in volatility could then trigger a selloff in these assets underlying these products, amplifying the shock to markets. —Tobias Adrian, quoted in the Financial Times, October 30, 2017. Could similar price action occur again? Perhaps, but much of the potential risk has been eliminated. According to The Wall Street Journal, on February 12 after markets had settled down, speculative investors, or those classed as non-commercial by the Commodity Futures Trading Corp, swung from a net 60,000 contracts that wagered against the VIX the week before the market turned to an 86,000-contract bet in the VIXs favor by February 9. This strongly suggests that much of what exacerbated the plunge has been washed out. 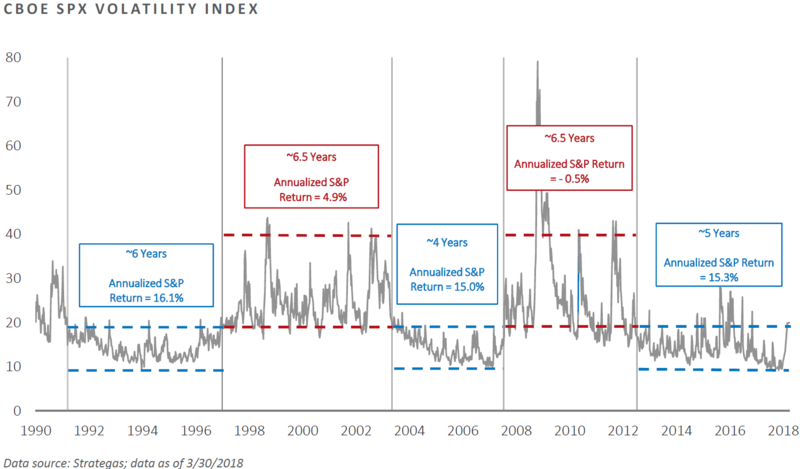 Investors should recognize that not only does it seem likely that stock market volatility has broken out to a higher absolute level, but the volatility of volatility has increased as well. Changes in the speed and direction of stock market moves have accelerated and could continue to do so. Long-term investors may increase their probability of success by resisting the temptation to base decisions on short-term price action, choosing instead to focus on fundamental factors that play themselves out over long periods of time. The aforementioned shock in stock market volatility was in part initiated by a strong jobs report that indicated the potential for inflationary pressures to build—a change to the status quo of much of the past nine years. Inflation, higher rates, and the potential fallout from trade wars are all causing skittishness among investors. One less-discussed development that is making some market participants nervous is the sudden increase in correlation between stocks and bonds. Nominal Treasuries have historically benefited during flight-to-quality environments, as investors have sought the relative safety of the faith and credit of the U.S. as well as the U.S. dollar. For almost a decade, the relative strength of the U.S. dollar elevated global disinflationary fears, and the prospect of an incrementally tighter monetary policy put downward pressure on long-term Treasury yields. Core bonds, as represented by the Bloomberg Barclays U.S. Aggregate Bond Index (BBAG), have historically experienced a fraction of the volatility of stocks. They have also often provided more stable—if not more meaningfully positive—returns during stock market stress. Stress on stocks can be caused by the effects or the anticipation of a recession. The Fed often responds to recessionary pressures by lowering rates, which is generally good for bonds. Lately, however, the situation has been different. Buoyed by a strengthening economy and the new tax law, recessionary risks today appear low. What is happening now, in contrast, is that rates are rising to meet economic strength—a development that can place pressure on stocks that exhibit high price/earnings multiples, such as U.S. equities. Interest rates have declined steadily since 1981, particularly in the age of quantitative easing, thus there are few examples of rising rates in recent memory. That said, the current environment exhibits characteristics similar to those observed in early 1994. In December 1993, the 10-year Treasury yield was 2.85%. Just six months later in June 1994, it was 5.96%. Over that period, the BBAG fell an uncharacteristically painful 3.9%. Simultaneously, the U.S. equity markets fell 3.4%. In 1994, the BBAG dropped 2.9%, making it the worst year on record since 1976. Another pertinent example is the bond market action surrounding the “taper tantrum” in 2013. In calendar year 2013, the 10-year U.S. Treasury yield reached its year-to-date low on May 2. Over the 36-trading day period spanning May 2 through June 25, the 10-year U.S. Treasury yield rose 91 basis points from 1.66% to 2.57%, higher than all but 3% of 36-day periods over the past 50 years, most of which occurred during Paul Volker’s rate hiking designed to rein in the runaway inflation of the late 1970s and early 1980s. During those 36 days in 2013, bond market performance was abysmal–the BBAG plunged 4.2%. The point of these examples is to illustrate how rising interest rates can levy heavy losses on fixed income investments—a pain that few investors who have been in the business less than 35 years have had to endure. Many may not be prepared for such negative price action, which supports why the recent inability of bonds to hold value during a period of stock market stress has been met with such trepidation. Market activity over the past few weeks reinforces the merits of true diversification at the portfolio level across a multitude of idiosyncratic investments. A common theme throughout these pages is the recent resurgence in inflation and the subsequent and expected future increases in interest rates. Commodities are commonly expected to provide a hedge against inflation. Although commodity prices have generally firmed of late, FEG continues to believe the detractors of that asset class outweigh the merits, with one important caveat discussed further on. If an investor seeks to make an allocation to commodities and requires full liquidity, this must be done indirectly through the commodity futures market, which includes a host of challenges. First, only a portion of the return an investor earns from commodity futures comes from the performance of the spot commodity price. Income on collateral and roll yield both have a significant impact that can dwarf price-driven performance. Despite increasing interest rates, income remains limited and roll yield often detracts from returns due to the fact that some futures are priced in contango, such as oil contracts, for example. In contrast to commodity futures, and despite challenging recent price action, midstream energy represents a more favorable long-term opportunity. FEG recently published a “MLP Market Update” memo outlining an updated view following the March 15 announcement of the Federal Energy Regulatory Commission (FERC) on a ruling that impacts the allowances Master Limited Partnerships (MLPs) can pass through as part of their rates to customers. While this recent announcement by FERC has resulted in significant declines for MLPs, the fundamental backdrop for midstream energy remains positive and MLP yields are now at multi-year highs. Real Estate Investment Trusts (REITs) have also experienced recent poor performance in part due to rising interest rates. As interest rates remained abnormally low in recent years due to central bank activity, many investors ventured out the risk spectrum in order to capture yield. REITs were one beneficiary of that activity. As interest rates have risen, some investors are choosing the safety of fixed income over REITs as the spread between REIT and Treasury yields has narrowed. The marginal change in sentiment has placed downward pressure on REIT prices. 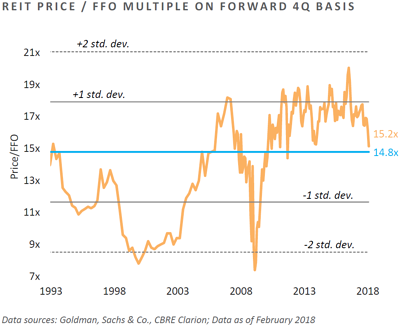 A neutral stance may be prudent at this time in recognition of the potential headwind from higher rates combined with valuations that have become more attractive. Regardless of long-term potential or short-term price action, many favorable opportunities can be found in private real estate investments for those with the wherewithal to access them. Commodities like oil and gas can be accessed directly through private investments without the shortcomings of the futures market, and skillful managers can bring unique competitive advantages. Manager selection in private real assets is critical, however, as the spread between top quartile performers and their bottom quartile counterparts can be vast. Diversifying strategies (DS) encompass a wide-ranging set of investment techniques and methodologies with the collective goal of providing returns that are achieved through limited equity and interest rate risk. In an environment where fixed income could be challenged due to rising interest rates, a DS mandate might provide a desired amount of protection against stock and bond market volatility. Different DS strategies have different environments that are favorable or challenging. In the case of one DS subcategory—event-driven—the backdrop appears to be setting up favorably. Many event-driven strategies seek to profit on the disparity in price between an acquiring company and the target relative to the respective fair value of each. If, for example, an acquisition offer is announced at a certain price, the stock of that target company will often not reflect the full stated price given the risk that the deal might not go through. If a skillful manager believes the deal is eminent, a purchase can be made at the lower value and a profit then realized when the deal goes through at the stated price. Event-driven managers have a more fertile opportunity set when the amount of merger and acquisition (M&A) activity is high, which has been the case thus far in 2018, with global year-to-date announced deal volume at $449 billion, up 21% from 2017. Aggregate M&A “firepower,” or the sum of a company’s readily available cash and debt capacity within its credit rating, is currently estimated at $5.0-$5.5 trillion for the S&P 500 (excluding financials and utilities), up from $3.3 trillion at the start of 2017. With more potential deals to choose from, event-driven managers can invest more selectively, which could result in better performance, all else being equal. Considering the many reasons for fear globally in 2017, and those which still exist today, it is possible that price volatility is understating actual risk. If volatility moves higher, many DS managers will find a more fertile investment opportunity set. An updated version of that chart, shows a potential breakout of the prior low-volatility range. Therefore, managers whose strategies were inhibited by the protracted low volatility observed in the past few years may find the future environment more favorable. More so than at any other time in recent memory, global markets now seem to move with unprecedented speed and directional changes. Not long ago, pundits frequently quoted the record amount of time without a certain percentage move. Experienced investors knew volatility would not remain low forever, and with one explosive day in early February, the market has shifted into a new phase. Moving into the early days of the second calendar quarter of 2018, markets are reeling from talk and action surrounding tariffs and trade wars. Markets abhor surprises, disruptions, and a perceived lack of vision in public policy. With regard to monetary policy, markets have largely absorbed higher rates and the beginning of Fed balance sheet tapering because of consistent forward guidance. Unfortunately, fiscal policy at present lacks the same confidence-earning qualities. No one can predict the full economic implications of tariffs or trade wars, but early market reaction suggests concern. At such time–and always, for that matter–the long-term fundamentals of seeking investments with attractive valuations, allocating to them in a globally diversified mix, and doing so through managers with a demonstrable competitive advantage are critical means by which investors can achieve their long-term goals. 1 Collin Brennan, “Millennials Earn 20% Less than Boomers Did at Same Stage of Life,” USA Today, January 13, 2017. 2The Cboe VIX is based upon implied volatility prices on S&P 500 index options. Demand for put options, insurance against loss, typically increases as the stock market declines, which is why the VIX generally increases when stock prices fall. 3A trade that effectively sells volatility pricing. Short volatility generally performs well when volatility pricing declines and can experience losses when volatility moves higher. The Bloomberg Barclays Capital Aggregate Bond Index is a benchmark index made up of the Barclays Capital Government/Corporate Bond Index, Mortgage‐Backed Securities Index, and Asset‐Backed Securities Index, including securities that are of investment‐grade quality or better, have at least one year to maturity, and have an outstanding par value of at least $100 million. The HFRI Monthly Indices (HFRI) are equally weighted performance indexes, compiled by Hedge Fund Research Inc., and are utilized by numerous hedge fund managers as a benchmark for their own hedge funds. The HFRI are broken down into 37 different categories by strategy, including the HFRI Fund Weighted Composite, which accounts for over 2000 funds listed on the internal HFR Database. The HFRI Fund of Funds Composite Index is an equal weighted, net of fee, index composed of approximately 800 fund of funds which report to HFR. See www.hedgefundresearch.com for more information on index construction. The MSCI ACWI (All Country World Index) Index is a free float-adjusted market capitalization weighted index that is designed to measure the equity market performance of developed and emerging markets. The MSCI ACWI consists of 46 country indexes comprising 23 developed and 23 emerging market country indexes. The developed market country indexes included are: Australia, Austria, Belgium, Canada, Denmark, Finland, France, Germany, Hong Kong, Ireland, Israel, Italy, Japan, Netherlands, New Zealand, Norway, Portugal, Singapore, Spain, Sweden, Switzerland, the United Kingdom and the United States. The emerging market country indexes included are: Brazil, Chile, China, Colombia, Czech Republic, Egypt, Greece, Hungary, India, Indonesia, Korea, Malaysia, Mexico, Peru, Philippines, Poland, Qatar, Russia, South Africa, Taiwan, Thailand, Turkey* and United Arab Emirates. The S&P 500 Index is a capitalization-weighted index of 500 stocks. The S&P 500 Index is designed to measure performance of the broad domestic economy through changes in the aggregate market value of 500 stocks representing all major industries. This report was prepared by Fund Evaluation Group, LLC (FEG), a federally registered investment adviser under the Investment Advisers Act of 1940, as amended, providing non-discretionary and discretionary investment advice to its clients on an individual basis. Registration as an investment adviser does not imply a certain level of skill or training. The oral and written communications of an adviser provide you with information about which you determine to hire or retain an adviser. Fund Evaluation Group, LLC, Form ADV Part 2A & 2B can be obtained by written request directed to: Fund Evaluation Group, LLC, 201 East Fifth Street, Suite 1600, Cincinnati, OH 45202 Attention: Compliance Department. Diversification or Asset Allocation does not assure or guarantee better performance and cannot eliminate the risk of investment loss. This report is intended for informational purposes only. It does not address specific investment objectives, or the financial situation and the particular needs of any person who may receive this report.